We are extremely proud to have produced the first ever Five Year Old Whiskey from the great state of Missouri! 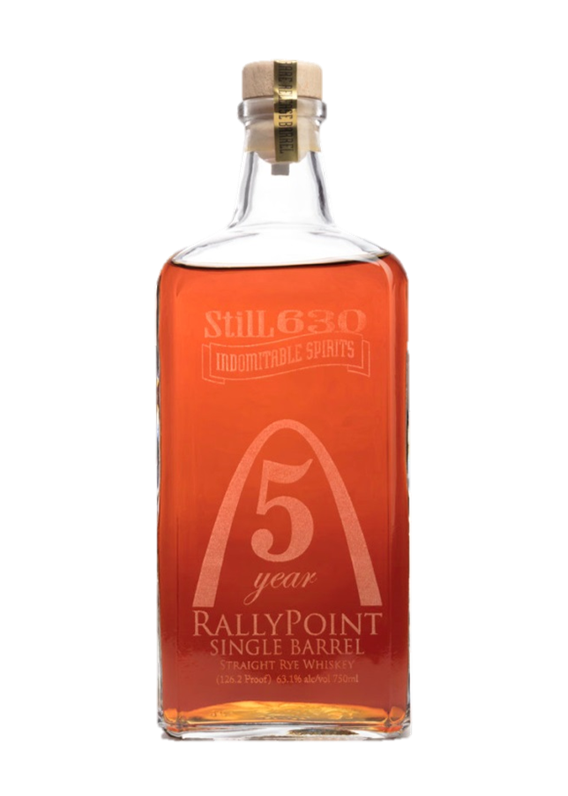 Laid down Sept 16th, 2012, we came in early Saturday morning on Sept 16th, 2017 to bottle and release that incredible whiskey as an un-cut, un-filtered barrel strength version of our flagship RallyPoint Rye Whiskey. We think it might be the best thing we've released yet. Intensely delicious rye whiskey, wrapped in luscious oak, this is a whiskey lover's dream. In 2018, it was named the BEST CRAFT WHISKEY IN THE COUNTRY by the American Craft Spirits Association!! Now we do it as a yearly release. Batch II came and went on StilL 630 Day in 2018. The 2019 batch we are calling Big Jake’s Anniversary Edition because we are releasing it at our April First Friday Experimental release on 4/5/19. As the fates decree, this just happens to be the anniversary of the day Big Jake officially became a part of our family, so we figured we’d add the big guy’s paw print to the bottle! Only 181 bottles were produced and they were all hand-engraved for this special 126.1proof, un-cut, un-filtered whiskey. Pre-order them now or regret it all year! ACSA 2018 BEST OF CLASS - "WHISKEY"
Batch I was the First Ever 5 Year old whiskey from MO!